The Ninja Knitters prepare for their yarn bombing operation in Bedale. Bedale was struck by a yarn bombing night operation last week. Residents woke to discover their town covered in numerous woolly Easter bonnets. A new group called ‘Ninja Knitters’ struck to decorate the town for Easter and to mark the start of the tourist season. 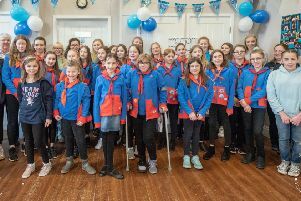 Ward member and chairman of Hambleton District Council, Councillor John Noone, said: “I salute the work of this amazingly dedicated, secret group.